or click here to supply your information. 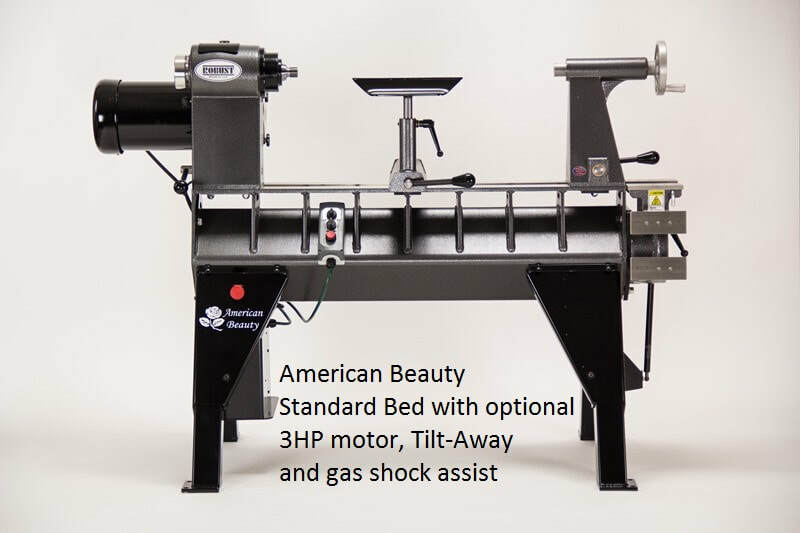 FOR WOODTURNERS AROUND THE WORLD OVERVIEW: The American Beauty lathe has a sliding headstock, stainless steel ways and industrial grade motor and controls. It can be purchased with a 2 or 3HP motor in 220 volt only. Variable speed, forward and reverse are standard. 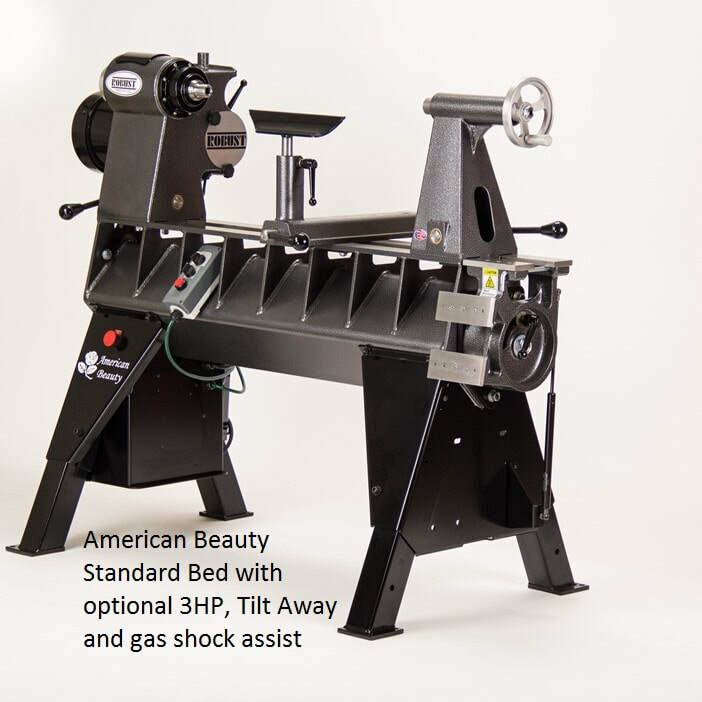 ADJUSTABLE HEIGHT: The American Beauty adjusts to fit you. Each leg is made from 3 x 3 square steel tubing and adjusts independently. The apron that holds the leg is made from 7ga. steel. There are lips in the aprons where you can put a shelf to hold tools or add more weight. POWER TO SPARE: Low end torque is ensured by the vector style motor drive with auto tune. The motor drive (aka: “VFD” or “Inverter”) is housed below the lathe in the leg assembly, protected and out of the dust. Motors are either Baldor or Leeson. Either motor is high-efficiency and industrial-grade. Both are made in the USA. 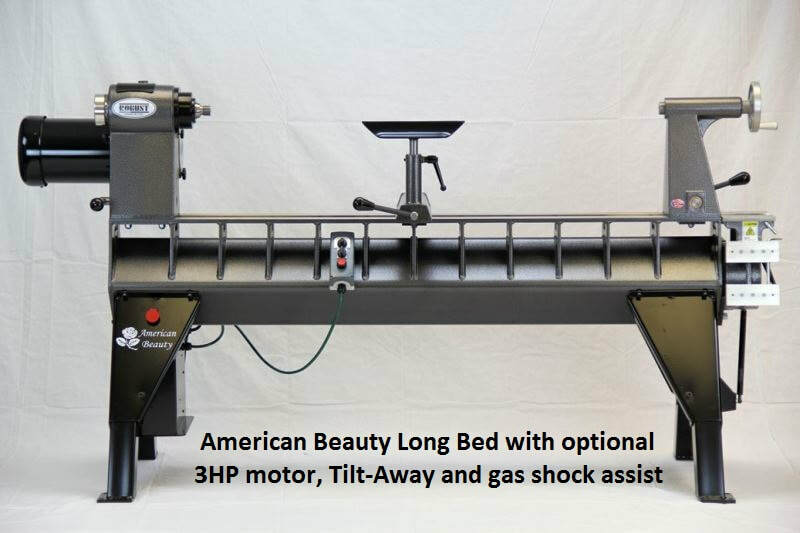 In addition, there are two belt ranges: high speed and high torque. CONTROL: The corded pendent controller is fitted with two rare earth magnets and can be moved anywhere along the lathe bed, on the leg assembly, tailstock, banjo or on the headstock. 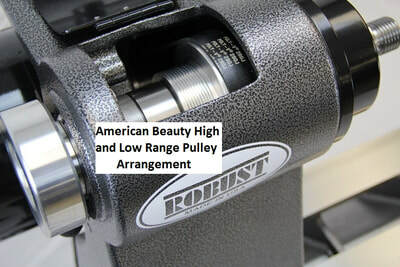 You can start and stop the lathe, change direction and change speed all with this unit.BEARINGS: We use heavy duty 6300 series on the American Beauty which carry 40% more dynamic load than the bearings the competition uses on their big lathes. Because of this, we are the only lathe manufacturer to warrant the headstock bearings, AND to warrant them for a full seven years. That's two years longer than any other major lathe manufacturer warrants anything. 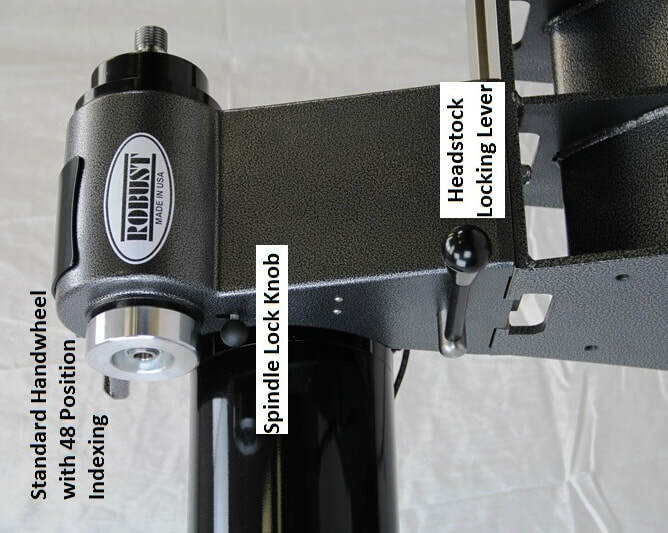 SPINDLE: Spindles are machined from pre-hardened and stress relieved 4140 Chrome Moly alloy steel. 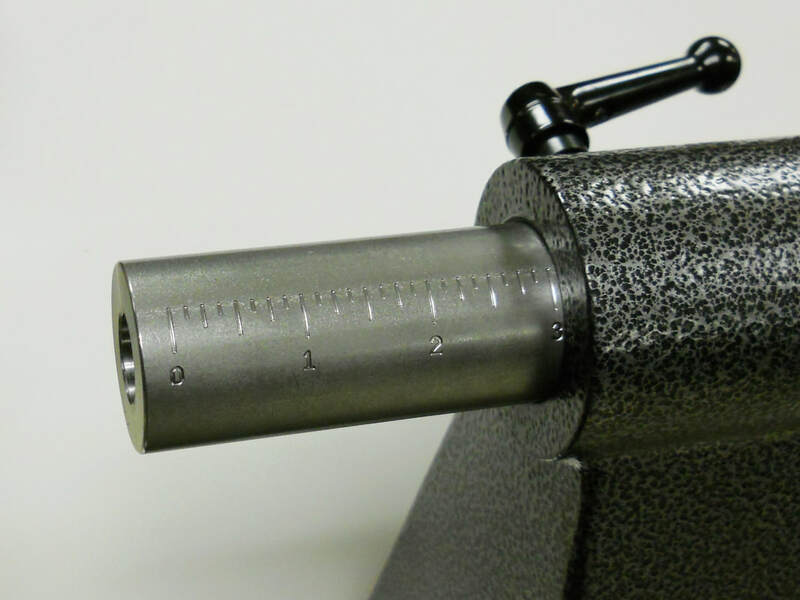 The bearing journals are precision ground to within 0.0003". We also use the universal standard spindle nose size for larger lathes: 1 1/4" – 8 TPI, so that a great variety of chucks, faceplates and other accessories will fit. A metric spindle threaded 33 x 3.5 is also available. Recognizing the need to turn in reverse occasionally, especially for sanding, our spindles incorporate a safety groove for a set screw. 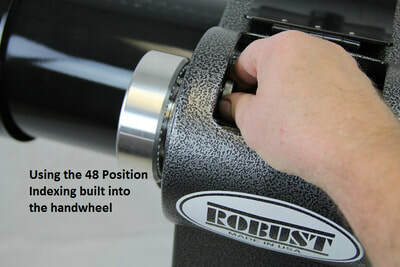 Locking the spindle disconnects the controls, so no more burnt belts if you try to start the lathe with the spindle lock engaged. 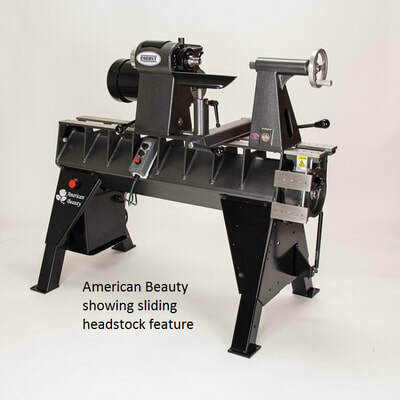 HEADSTOCK AND TAILSTOCK: The headstock is relieved in front, allowing great access to the back of the work. 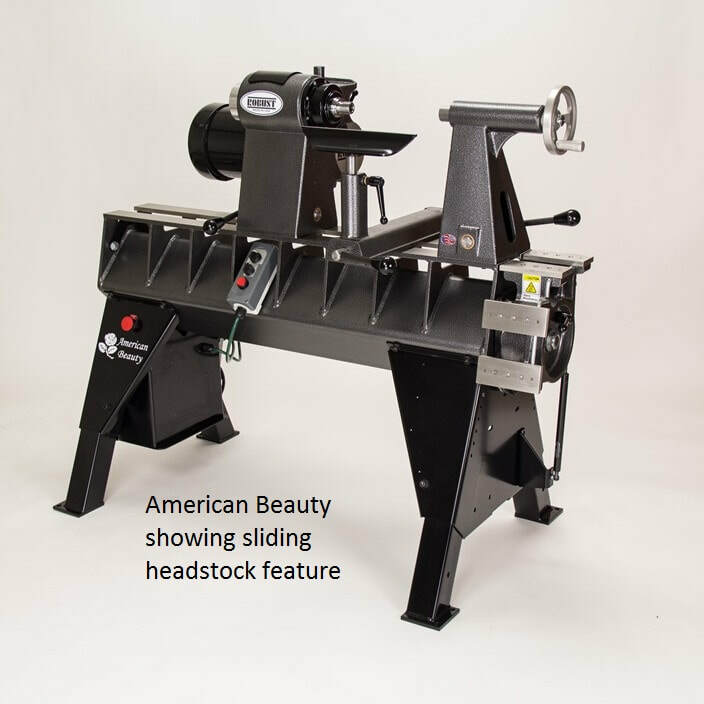 Both the headstock and tailstock are formed from cast iron in a US foundry and then precision CNC machined to exacting tolerances. To move them, lift the large lever, slide to the new position, and push down on the lever to lock it in place. To ensure alignment, push them against the back way when you lock the down. This way the tennon underneath makes firm contact and lines up the centers. 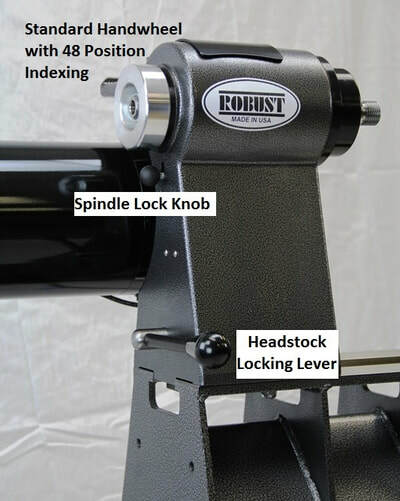 INDEXING: 48 position indexing is standard and accessed from inside the headstock. 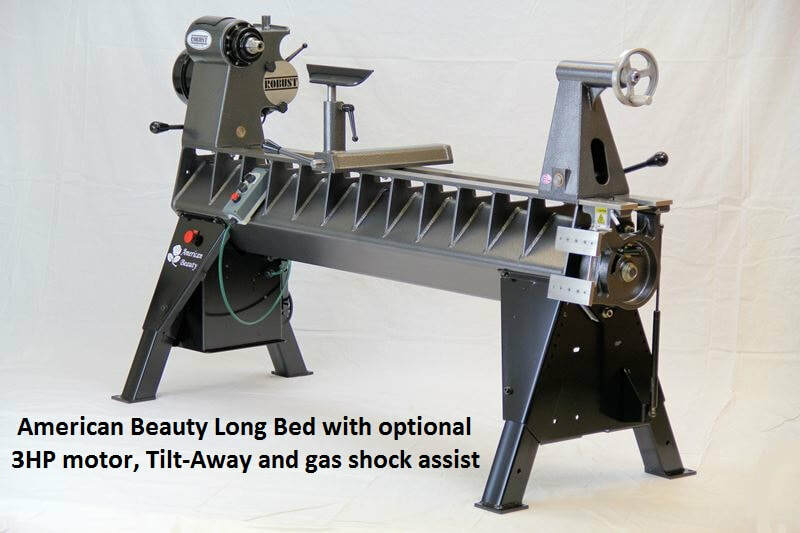 BED CONSTRUCTION: All Robust lathes come with stainless steel ways standard. We use 3/8" thick structural steel tubing on the American Beauty. The bed is a square tube set on the diamond – that lets the chips fall away much better than a round bed or a cast bed with reinforcing ribs. Bed extensions are constructed of the same heavy materials.